Identify water leaks before mold has a chance to get started! MOLD WILL START TO GROW WITHIN 24-48 HOURS AFTER AN UNADDRESSED WATER EVENT! Even a minor, hidden water leak untreated can result in major mold problems, and thousands of dollars in damage. And a severely mold-contaminated house can’t be lived in or sold! Once moisture combines with dust or mold-friendly materials like drywall, mold can start growing and spreading in as little as 24-48 hours. Use this Water Alarm to help prevent costly mold and water damage which may not be covered by insurance. Just place the sensor (suction cup up) under a sink, water heater, next to your sump pump, or anywhere else an unexpected water leak may occur. The 85 decibel alarm will sound (for up to 3 days) if water bridges between the two contacts. The alarm can be table, shelf, or wall mounted away from the sensor. 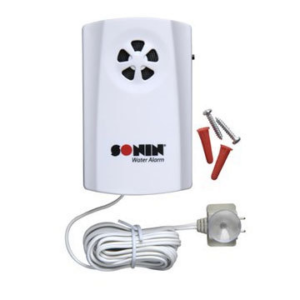 This Water Alarm can warn of leaks and overflows in bath, kitchen, laundry, furnace, computer rooms or anywhere there is a potential for leaks. Sounds for up to three days. Perfect for unattended filling of bathtubs, pools, spas, etc. Use the suction cup to attach the sensor to any smooth vertical surface. The buzzer will sound when the water reaches both metal contacts on the sensor.